I have to admit, I was not particularly excited to start this month’s Daring Bakers challenge. 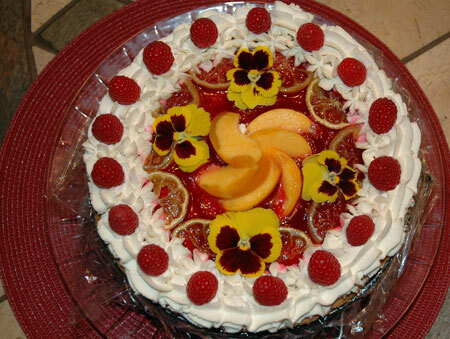 It reminded me a lot of the strawberry mirror cake, my very first challenge in July of 2007: just past the season for fresh strawberries, with layers of sponge interspersed with gelatin-stabilized Bavarian cream in a springform mold. I noticed quite a few mirror finishes in the Daring Bakers forum for this one, so clearly I was not alone in the comparison, but since my family didn’t really care for that cake other than its looks, the similarities didn’t add to its appeal. I was much more fired up about last month’s baklava, but unfortunately the time to make one never materialized; I have had my eye on a recipe involving homemade chocolate phyllo for several years, though, so that is definitely on the to-do list for this autumn. We had a dinner party with several friends this past Sunday night, with lamb gyro meat, chicken souvlaki, tabbouleh, hummus, and tzatziki (which no one but me could pronounce; the closest my mom got was suzuki), all wrapped in homemade pita. The perfect dessert would naturally have been—you guessed it—baklava, but since that was off by a month, I reluctantly decided to give the fraisier a shot. Of course, technically it wasn’t a fraisier because I didn’t use strawberries. My first thought was peaches (pechier?) and raspberries (framboisier? ), but for a while there, the peach element was touch-and-go, so I ended up flavoring my chiffon cake with lemon (citronier?) and making candied lemon slices just in case. I made a few minor adjustments to the chiffon cake, mostly by using cake flour and lemon extract in place of all purpose and juice. I also used a 9″ springform because I don’t have an 8″ one, and was a little anxious about not having enough batter for the larger size. 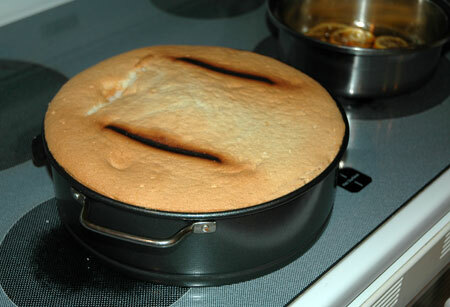 As it turned out, however, there was so much batter I can’t even imagine trying to squeeze it into an 8″ pan; even a 10″ pan would have been fine, and the one I used was so full that the cake rose straight into the oven’s heating element. It evened out as it cooled, however, and I was able to trim the burn marks off with a serrated knife. I made the cake, candied lemons, and pastry cream base the night before I assembled the dessert, since I was still waiting on the peaches. As soon as they arrived, however, I sliced them up and started building layers. My parents aren’t usually around when I am making fancy desserts, so they were tickled at the process and took some photos for me. 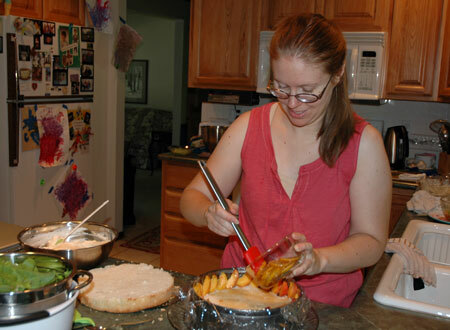 Here I was brushing the bottom cake layer with lemon simple syrup from the candied lemon slices. 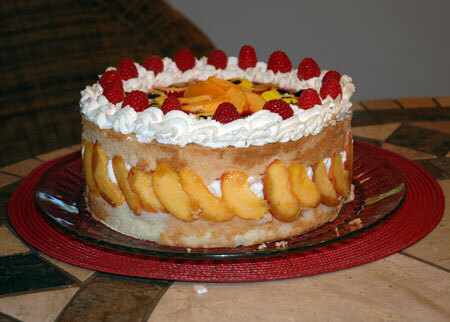 More than anything, I was anxious about the pastry cream mousse: whether or not it would squish out in front of the peach slices and look sloppy, and whether or not it would have sufficient time to set up and bear the weight of the cake. I ended up piping between the peaches, but used a spatula to spread the rest of the cream, dotted with fresh raspberries, in between the layers. Rather than reserving some cream to go on the top cake layer, I opted to make a quick raspberry coulis from a basket of berries melted with sugar and a few of the less shapely lemon slices, strained, and thickened with a bit of cornstarch. I edged the cake with sweetened whipped cream (stabilized by whipping in the food processor), and covered it with a mosaic of fruit. About seven hours later, I took the cake out of the refrigerator, held my breath, and released the springform. 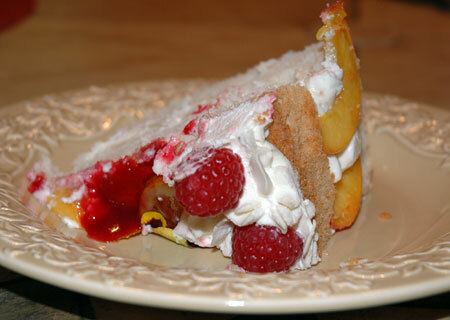 My cake was built directly on a glass platter, and the bottomless springform was wrapped in plastic wrap and coated lightly with coconut oil to help facilitate the release, but I was uncertain whether the whipped cream piping around the edges would survive intact. It held up to slicing beautifully, but the pastry cream mousse was still pillowy soft, a much more appetizing texture for me than the Bavarian cream of four years ago—or maybe my baking skills have just improved since then! As a whole, the confection was not only beautiful to look at, but light and airy, full of fresh flavors that were the perfect cap to a summer evening. Despite how reluctantly I came to this month’s challenge, I could not be happier with the outcome, so many thanks to Jana for her choice! Your cake is absolutely gorgeous! The piping, the flowers, the colors… so beautiful! 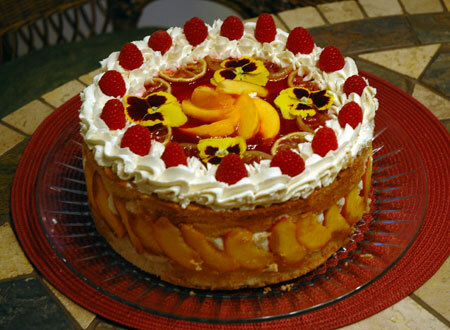 Your fraisier looks beautiful and I would imagine the peaches and raspberries make a tasty combination. I’m glad you decided to complete it this month. Nice job on the challenge! Oh WOW, I wish I had been a guest in your house to share in the spectacle! Your fraisier is beautiful! 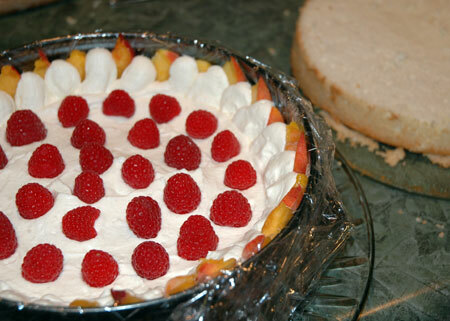 I love the combo of peaches and raspberries so I can only imagine that it tasted beautiful, too. Great job on this challenge! Wow! Your cake is gorgeous! Absolutely beautiful! Congrats on the challenge!